Just take a look at these boards: can you imagine these cheese and charcuterie boards at your company Christmas party or corporate event? As people reach for a slice of Brie de Meaux or Roquefort they might start reminiscing with their colleague about that summer spent in France after university, which then reminds the other of their honeymoon spent in Provence. Or talking about the goat cheese from Salt Spring Island starts a conversation about how cheese is made on Salt Spring and how your family toured the cheese shop. No doubt about it, if you want your corporate team coming together for fun and conversation, grazing boards and chef food stations are great. 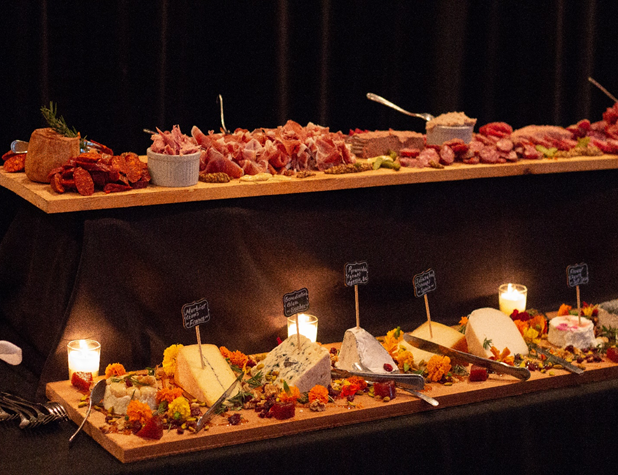 Featuring cheese from around the world as well as locally sourced artisanal cheeses from British Columbia; cheese and charcuterie meats are presented as an edible art pieces. 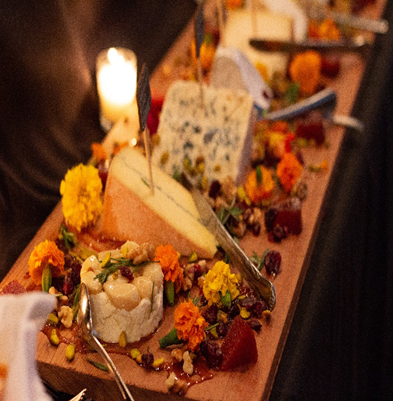 Served on 6-foot boards accompanied by edible flowers and other accoutrements, it’s a great stand alone or works well accompanying our other chef stations. We also make veggie boards and seafood boards with ceviche and smoked salmon and don’t worry because we bring everything you see here: the table cloths for the grazing stations, the plates, the cutlery and of course, the boards and all of the equipment. Bring the fun of your favourite taco restaurant to your office. 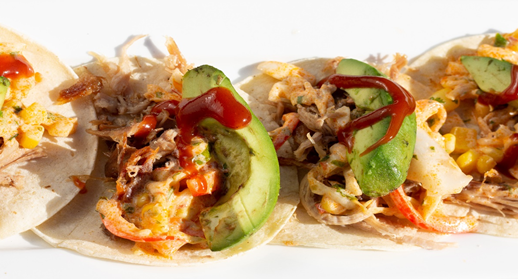 Your guests can make their own tacos with flavourful ingredients like chorizo sausage, pork carnitas, yam sofrito, papas bravas, and of course all the condiments like guacamole, red and green salsa and pico de Gallo to make your corporate team say “Ole”! The slider station: Delicious sliders always raise the level of excitement in any room and we also include our famous mini Yorkshire puddings with these sliders. These little gems feature triple A striploin, caramelized onions and a dollop of horseradish cream. Other sliders include: turkey sliders with scallion aioli, meatball sliders with marinara sauce and provolone cheese. Who doesn’t love cheese? 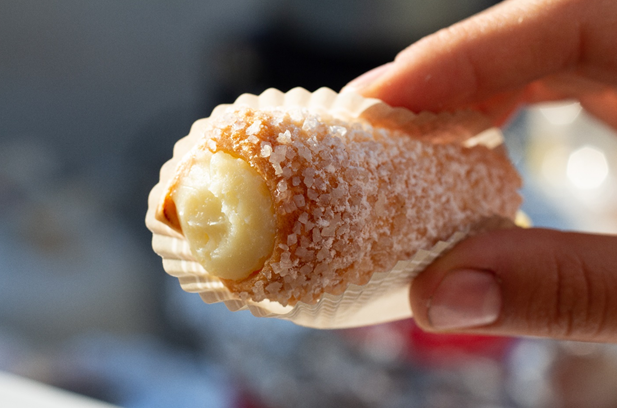 Why not make your fantasies of delicious, melted cheese come true at your next office event. We serve grilled cheese to keep both the vegetarians and the carnivores happy! Grilled cheese selections include Provolone cheese with pesto, Black Forest ham and Emmenthal cheese, bacon and cheddar, and goat cheese with grilled eggplant. All of these sandwiches are served on thick cut artisanal bread. This delicious station features many different kinds of Mac and Cheese. Try pulled pork Mac and Cheese, Cheddar and Bacon Mac and Cheese or Steak and Blue Cheese. Yummm! Delicious Christmas fare, and yes, it is that time of year again. Try our Cajun Fried turkey with Andouille sausage gravy, Roasted free-run turkey with pan gravy and apple-sage stuffing, Roast bone-in leg of ham with pineapple raisin glaze, brussel sprouts with pancetta bacon and balsamic syrup, whipped mashed potatoes. And always the most important…. Dessert! Try our persimmon fritters accompanied with vanilla ice cream, caramel sauce and egg nog crème brulee. And don’t forget the pastries. So have some fun and play with your food at Sugar Mountain Catering this Christmas season or any other time you need some stations to wow your employees or your clients. We serve the entire Lower Mainland: Vancouver, New Westminster, Coquitlam, Port Moody, Anmore, Maple Ridge, Surrey, Burnaby, Richmond, North Vancouver and West Vancouver. Just contact us at 604 728-6641 or by email at sugarmtncaters@gmail.com. You can always check us out at www.sugarmountaincatering.com as well and go to our contact sheet. We would love to serve you and look forward to sharing our “playful food attitude” with you.